Often described as both enigmatic and eccentric, and without a doubt, musical genius, Roy “Futureman” Wooten is one of the most innovative, forward thinking figures in modern music. Part of what makes Wooten such an innovative musician is the incorporation of science and invention into his work. His first invention, called the “Drumitar” is used extensively in the music of Bela Fleck and the Flecktones, which allows him the ability to replicate the sound of an entire contemporary drum kit, with the movement of just a few fingers on a guitar shaped instrument. Wooten has embarked upon a new creative journey with “The Black Mozart Ensemble.” Bridging the past with the present for a better future, Wooten is composing, producing, and directing a visionary new album/DVD entitled “The Black Mozart.” This project celebrates the life and music of the Black Mozart; Joseph Boulogne de Saint Georges. This 18th Century maestro and swordsman made contributions that revolutionized the world of musical creation. St. Georges used his abilities to find fame and fortune, yet as the son of a slave, remained an outsider. He fought against racism all his life, and can serve as a powerful hero for all of us as we struggle against the racism and divisiveness of today. Although Wooten is generally considered a background performer, his desire to express his thoughtful meditations often brings him to the forefront, and due in large part to both the Wooten brothers, (his brother Victor is their famed bassist and innovator in his own right), Bela Fleck and the Flecktones’ performances are always fresh and alive with improvisation and experimentation. Wooten’s Black Mozart Ensemble is comprised of young virtuoso violinists and cellists under Wooten’s direction. 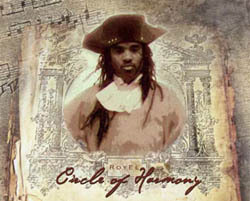 The music is complemented by the addition of hip hop artists, and actors/narrators. The music of Black Mozart has a message for the ears, eyes and moves of today’s modern world, and Wooten states that this composition, “The Black Mozart”, is a personal statement of New American Classical Roots and Dance Music with social aspirations that embraces all races of humanity. Many may wonder what Wooten alludes to when he speaks of an archetypal principle. An archetype is an idealized model of a person or a copy of a concept or object. Therefore, the words of Wooten are words of a personality that connects to life through his music. Some may question music’s ability to affect lives, but Wooten seems to be evidence that it does. The great jazz drummer Max Roach once said of Wooten, upon seeing him perform, that he knew that “that was the most creative approach to drumming he had ever seen.” His second invention, the “RoyEl,” resembles a piano but plays notes not found in the traditional western music scales. His third invention, the Dorothy Graye, also resembles a smaller piano and is dedicated to his mother Dorothy who inspired a practice method to learn the keys. This instrument is based to play off of the composer’s scriabin color to sound keys, with the universal mathematics guiding the exploration of tunings, such as the periodic table of elements and the golden ratio. In the wake of the Don Imus-Rutger’s Women’s basketball scandal, and the every growing debate over hip-hop and rap lyrics and it’s use of degrading and debasing words, it’s refreshing to find a merging of the modern and classical world in a truly innovative and positive way. Saint Georges himself might well agree.